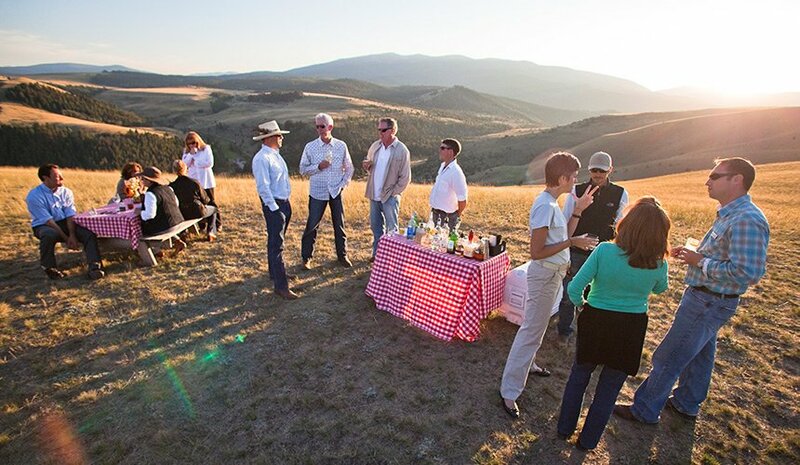 The Ranch at Rock Creek specializes in hosting destination events with exceptional culinary flare. 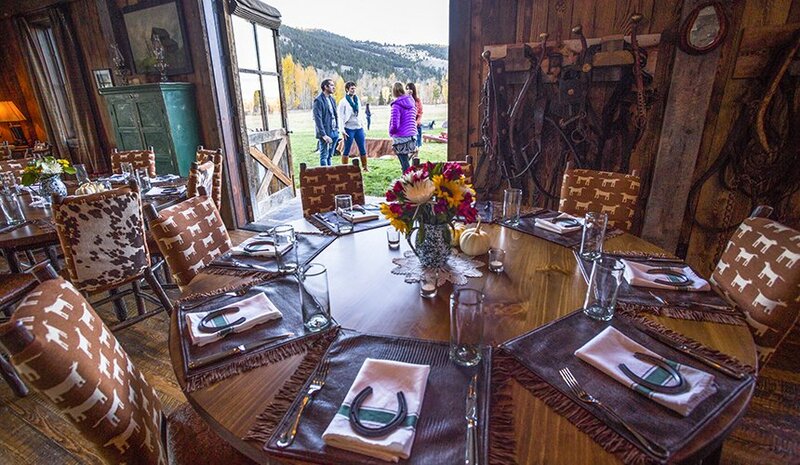 Guests can join our summer post-rodeo barbeques and seasonal celebrations, such as the Autumn Harvest Weekend or Thanksgiving, and experience the wild flavors of an authentic Ranch feast. 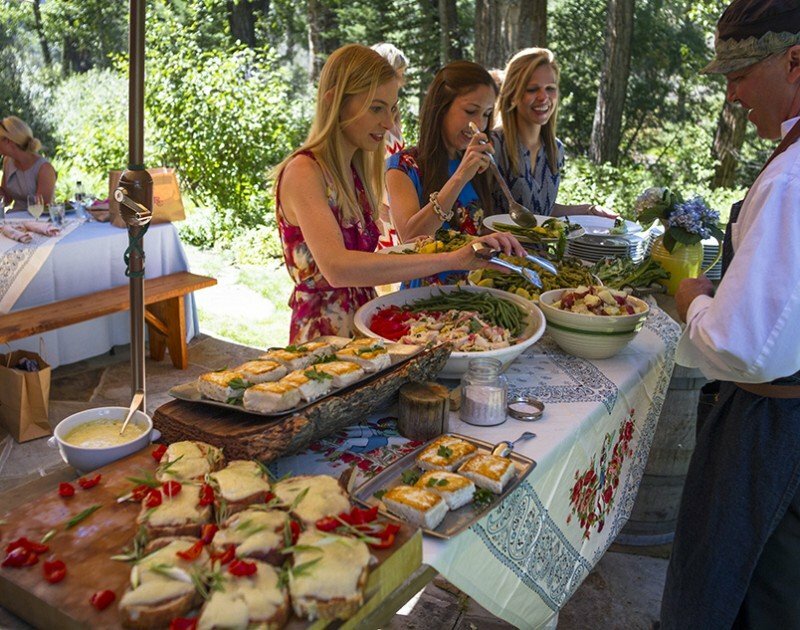 Chef Drage applies his extensive experience to thoughtfully create customized menus for weddings and other grand celebrations, such as family reunions and retreats. 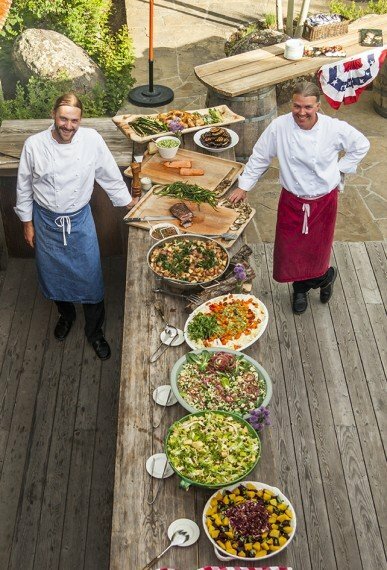 Behind the wood fire grill, Sous Chef Ben Miller and the culinary team will be working on-site in the expo kitchen to create your Montana experience. 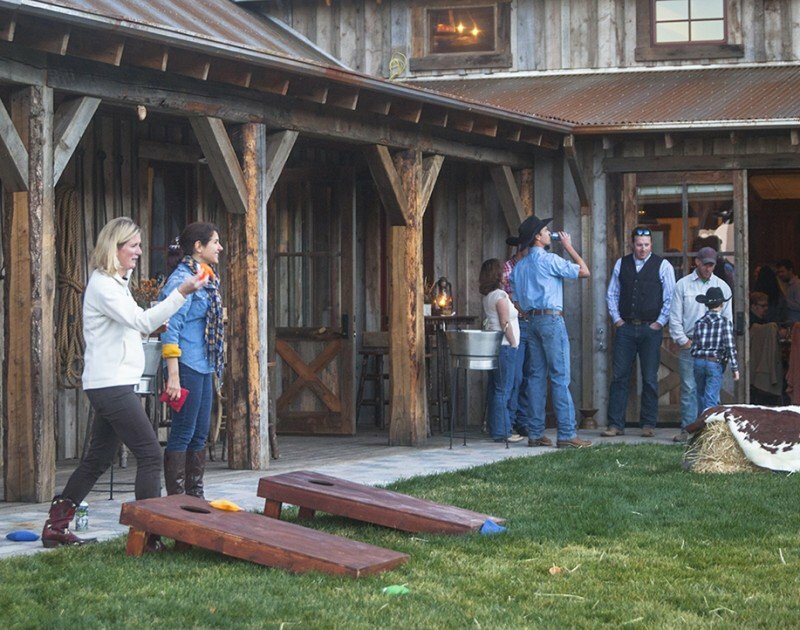 Events in our Buckle Barn and on the surrounding outdoor lawn can be created for groups of up to 250. Our wedding coordinator assists in tailoring the menu from signature cocktail to cutting the cake. To inquire about venue pricing, please submit a request for proposal. From the 2,700 sq. 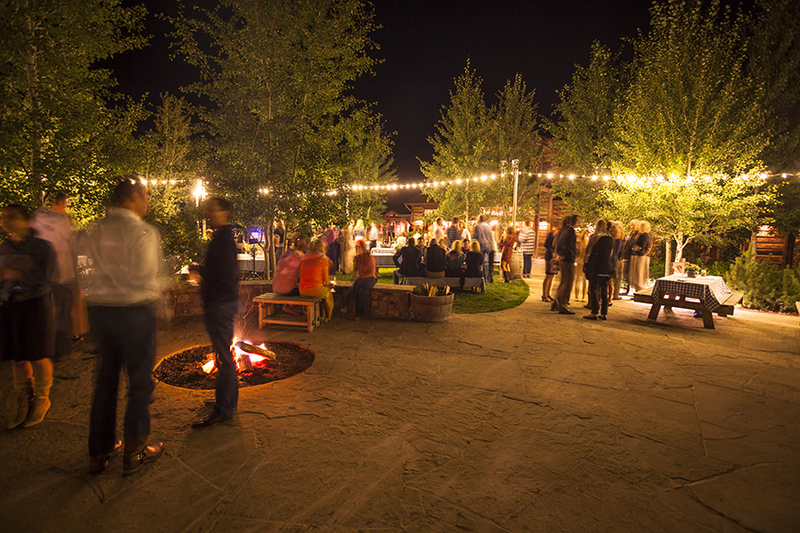 ft. Great Hall to the surrounding flagstone and manicured lawn, the Buckle Barn is our most versatile year-round venue. 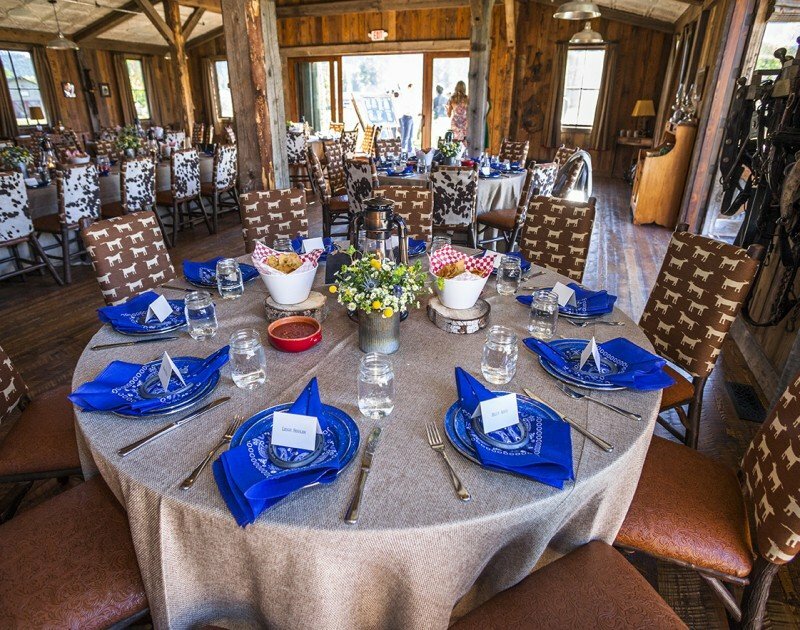 Bathed in natural light and built with reclaimed barn wood and stamped ceiling tiles, our event barn can be booked for private breakfasts, luncheons, dinners and receptions. Enjoy cocktails on the lawn and an indoor reception or choose to expand into a large outdoor tent. The Library is dedicated to brunches, meetings or small receptions. 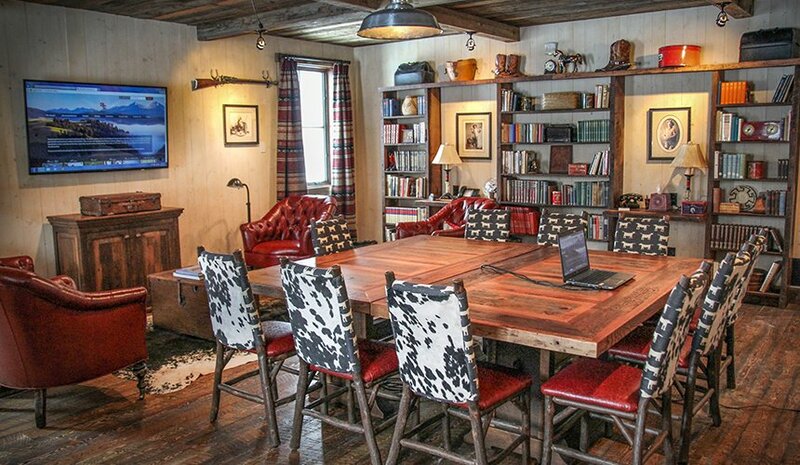 Comforts include upholstered chairs, a flat-screen TV, a wrap-around table and bookshelves filled with Western classics. This space also works well in combination with the Great Hall for a bar/lounge area or a kids dining room during a reception. The Flagstone sits at the center of the Granite Lodge courtyard by the Silver Dollar Saloon and the Granite Spa. 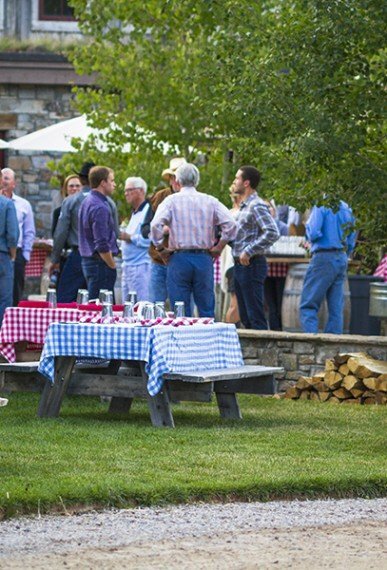 A wood fire outdoor grill and serving bar make it ideal for welcome receptions and festive outdoor meals. 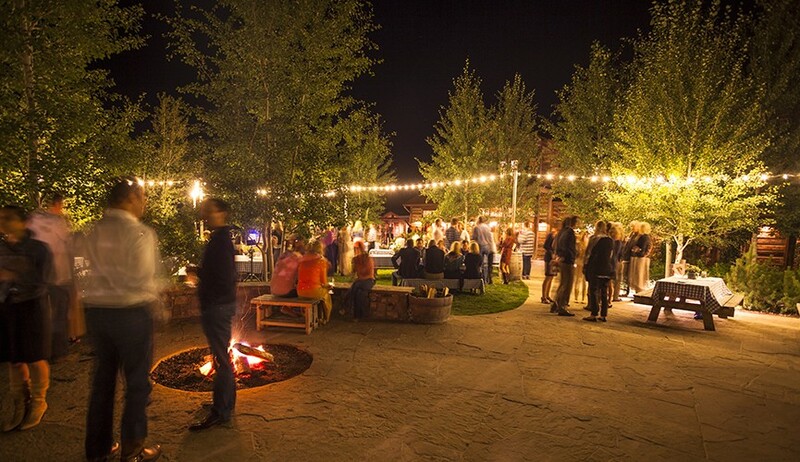 A welcome reception on the Flagstone may be provided free of charge with your wedding arrangements. 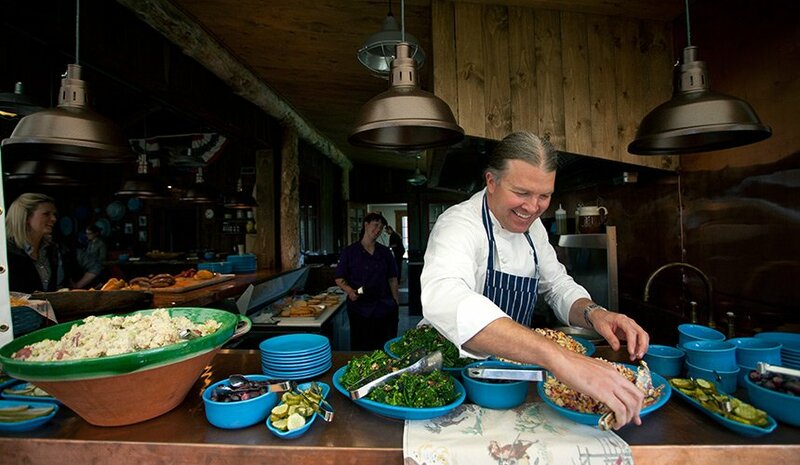 In concert with our custom glamping accommodations, The Blue Canteen is part ivory tent and part wooden cabin, featuring en plein air dining. An open kitchen provides a casual menu of burgers and barbeque, while fire pits and a wood stove radiate ample heat during an evening celebration. 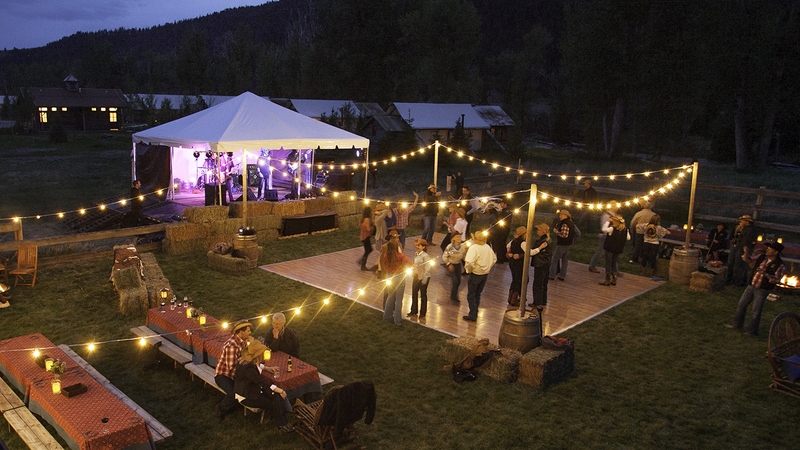 Manicured lawns next to Camp Roosevelt play host to one of our favorite wedding events, the Hoedown. 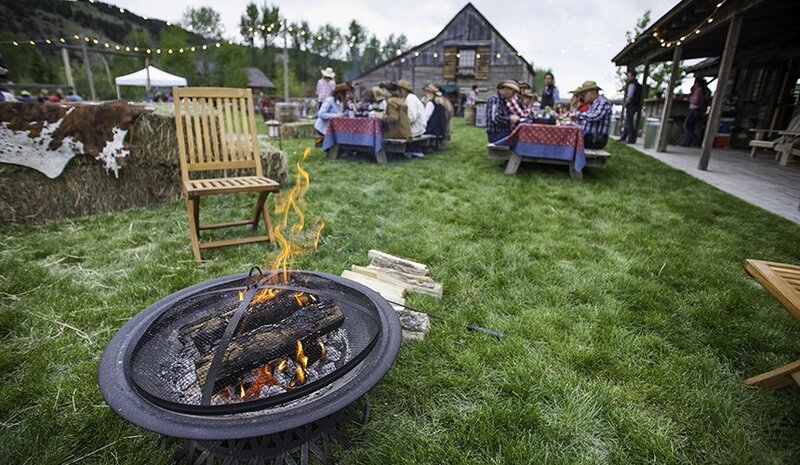 Although rustic in name, don’t underestimate the raucous good time provided by local musicians, dancing and a pig roast dinner served outdoors. Note: the Rod & Gun Lawn is only available for full or partial buy-outs. Partial buy-outs must reserve entire east side of Rock Creek. The Granite Lodge is reminiscent of the National Park lodges that defined Western luxury at the turn of the century. 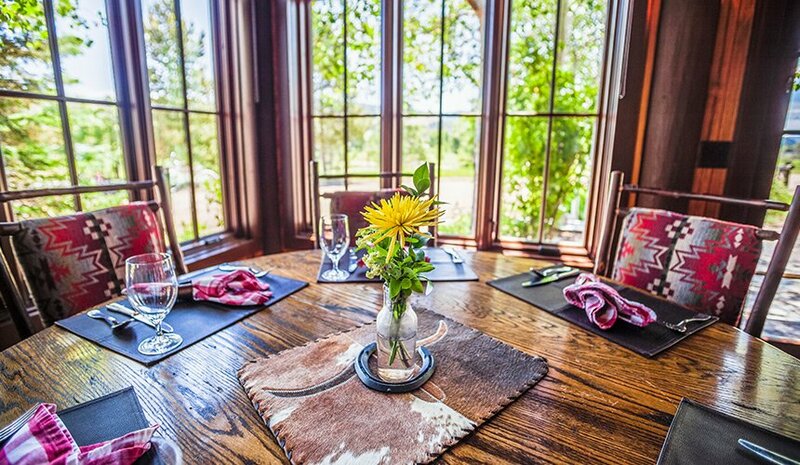 This year-round venue is excellent for four to six course meals featuring locally sourced ingredients. 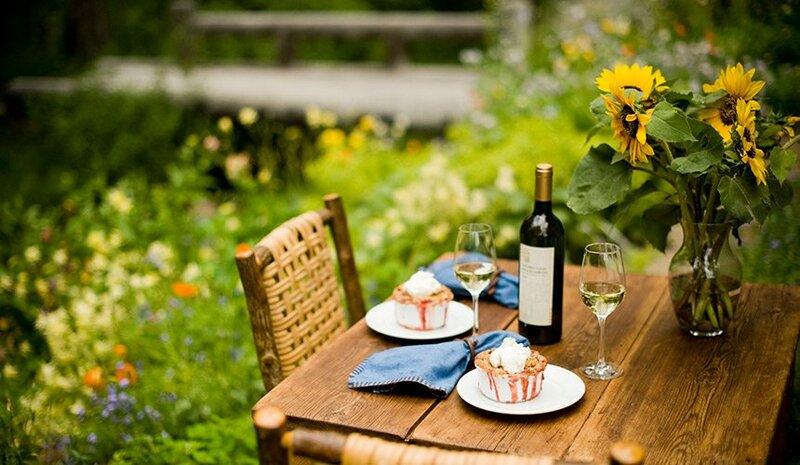 Each meal is complete with wine pairings. Note: Only available to full buy-outs. Travel by horse-drawn wagon with your wedding party, family or small group of wedding guests to enjoy a picnic at Piney Pond or Bikini Beach. Enjoy the fresh air and wildlife watching while you eat a picnic lunch served out of our historic chuck wagon. 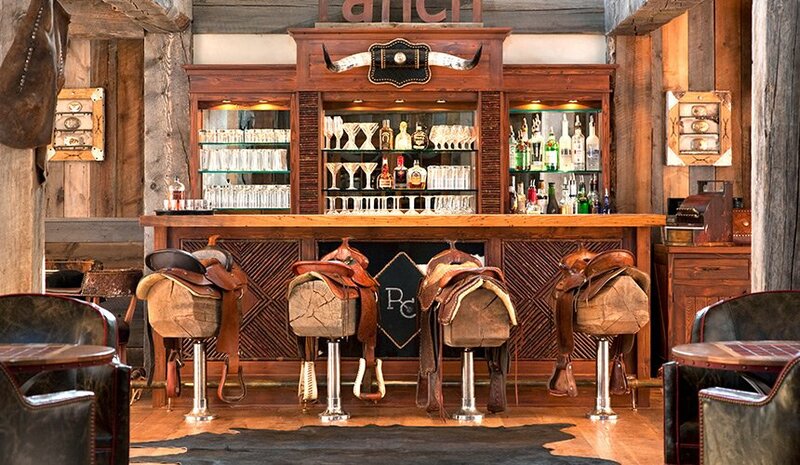 Savor an intimate moment and premium champagne from a Ranch vista—like Top of the World or Mary Beth’s Peak. Bring your photographer to the top and add a photo session framed by the Pintler, John Long and Sapphire Mountain ranges. In addition to evening entertainment, the Silver Dollar Saloon can be reserved for presentations and meetings. The 14-foot screen and sound system in the private cinema are ideal for presentations. The large floor space is flexible for various seating styles or even a group yoga studio.